The First Lady Cultivates 'American Grown' Gardening One of the first things Michelle Obama did as first lady was to dig up part of the beautifully manicured South Lawn of the White House and plant a vegetable garden. In her new book she says America has a long, proud history of gardening and it's time to reconnect with it. One of the first things Michelle Obama did as first lady was to dig up part of the beautifully manicured South Lawn of the White House and plant a vegetable garden. The garden was just one of Obama's many efforts to encourage Americans to eat nutritious food and live healthier lives. Her latest project, a book called American Grown, is a diary of that garden through the seasons and a portrait of gardening in America, past and present. On a hot May day in Washington, D.C., Obama took NPR's Renee Montagne for a tour of the presidential vegetable plots, the source of the vegetables and greens that make up state dinners and family lunches. "This is one of my favorite times for the garden ... because everything is bursting," Obama said, looking out over her tomatoes, tarragon, figs, rhubarb and (of course) broccoli. "We eat lots of broccoli, lots of fresh greens and lettuces of all kinds." There are also plenty of snap peas served in the White House, much to the chagrin of 14-year-old Malia Obama, who doesn't like them. The White House garden is also home to a beehive, where Obama gets honey for her tea and for her favorite snack of sliced green apples and honey. It "tastes like sunshine," she says. The honey also comes in handy for the White House's home-brewed beer. "We usually pull that out at Super Bowl time," she explained. 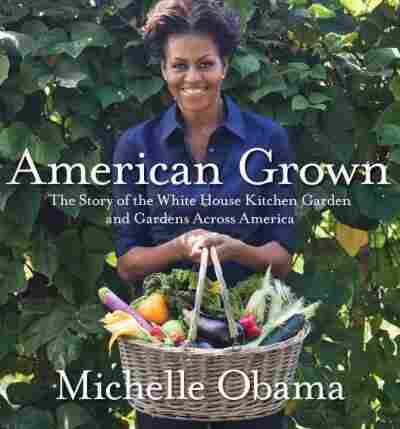 Gardening runs in Obama's family, though she didn't know that until she started doing research for this book. She learned from her mother that her maternal grandmother used to tend a community garden in Chicago. "My mom grew up in the South Side," Obama says. "They were a working-class family [with] six brothers and sisters. They couldn't afford to go to the grocery store, so there was a victory garden and that's where they got their vegetables." World War II was in full swing and Americans had been encouraged to plant "victory gardens" to reduce demand on the food supply. It was even deemed a patriotic act to eat food grown right next to the kitchen. As it turns out, the last vegetable garden that was planted at the White House was a victory garden. 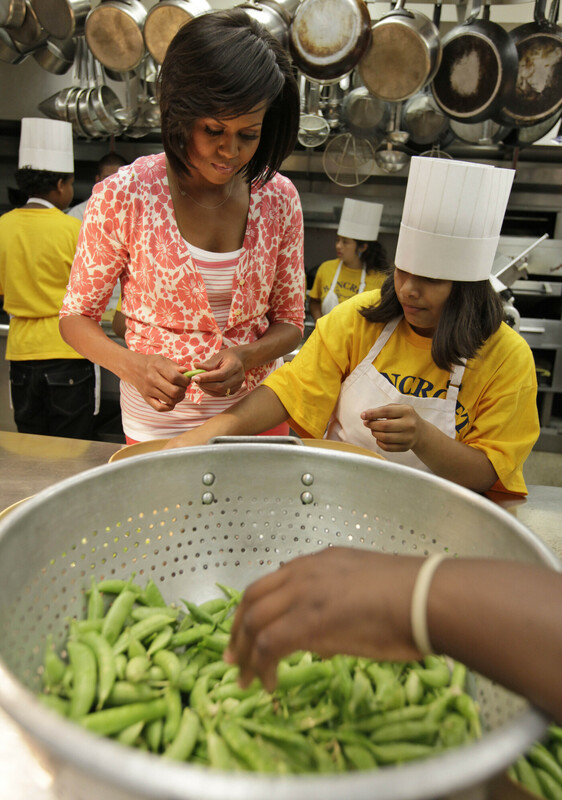 Obama shells peas with fifth graders from Bancroft Elementary School after they harvested vegetables from the first lady's garden on the South Lawn of the White House. 'This Was Not Going To Be Just Any Garden; It Would Be A Very Public Garden"
"It was planted by Eleanor Roosevelt, one of my heroines," Obama says. "She started the whole movement of victory gardens. ... We have a wonderful history in this country of community gardening and somehow along the way we lost that tradition. Part of what we hope to see is people reconnecting to that part of our heritage." Obama says her path to becoming a health advocate was a personal journey. "Before coming to the White House, I was a busy working mother. My husband was a U.S. senator and was often not home. We found ourselves eating out more than we should, packing on the sugary drinks ... the habits that you fall into just trying to get through the day. And our pediatrician kind of pulled me aside and said, 'You might want to look at your children's diet.' "
Obama was taken by surprise. The family got enough exercise and she thought she had been fairly conscientious, but the doctor said he was seeing some trends that he didn't like. He also told Obama about larger trends he was seeing in his other patients. "He was a doctor working primarily in the inner city," Obama explains. "He shared with me what he was seeing in his practice: the increase of Type 2 diabetes among his young patients; higher incidence of obesity." Obama says this conversation with the family pediatrician was one of the first times she had really considered the nutritional challenges of modern-day living — how hard it can be to stay healthy in a busy, urban environment. "What I suspected was that most people were like me," she says. "They weren't paying attention and they weren't trying to do the wrong thing — they just didn't know. So the hope when I came in [as first lady] was that we could start a conversation about kids' health." By now, Obama is well-known for her Let's Move initiative to address childhood obesity and encourage kids to get more exercise. "Kids aren't playing outside as much," she says. "The statistics show that kids are spending an average of 7.5 hours a day in front of some kind of screen. ... Fewer schools are offering PE — only 2 percent of public high schools in the country offer PE classes." Obama has also campaigned to get nutritious food more readily available in poor, urban areas. Recent studies have cast doubt on the idea of these so-called food deserts — finding that though these areas had high concentrations of fast-food joints, they also had supermarkets and produce stands. But Obama insists food accessibility is a problem that cannot be dismissed. "I'd like to take a couple of those researchers and drop them in several neighborhoods where I grew up and say, 'Go get a head of lettuce. One that's affordable, that's fresh' — and see what happens," she says. If you're living in Chicago, obviously there are grocery stores, but Obama says a mother with five small kids on a fixed income doesn't have the time, energy or money to take a bus or a cab to a supermarket that may be miles away. Physically and financially, these areas lack "the kind of accessibility that many more fortunate communities have," Obama says. Easy, affordable access to nutritious food is just one piece of the puzzle, though. "There are many reasons why we're here," Obama says. "Information and knowledge and exercise — all of those are a part of the solution." As for what to have for dinner tonight at the White House? The solution to that question can be found in their own backyard.